Four years ago, I read the screenplay of 'Lootera'. A couple of years later, just a fortnight before it was going on floors, I read it again and had a discussion on it with the writer-director. I also visited its sets during the Mumbai-schedule of the film. This March, I watched the First Cut of the film in the editing room. And last night, I watched the final film at a preview at Yash Raj Studios. Despite having observed the journey of this film from such close distance, its impact on me last night was phenomenal. To say the least, well, I could not sleep all night. And as its release approaches, I am more anxious than I have ever been for the release of a film, despite the fact that I was not really a part of it. This anxiety and sleeplessness has nothing to do with the film per se, or how much I liked it. It is much beyond that. It is a matter of inspirations and insecurities, of hope and hopelessness. It is the feeling that only true art can ignite in you, and in my case, only powerful cinema. Within a couple of days, the so-called film critics operating in our industry will inundate the minds of the masses with their star-bearing reviews that never dare to go beyond the synopsis of the story and how the first half of the film was vis-a-vis the second half. There are only a handful of critics, from whom I can expect to talk in ways only critics can and should. I dread to imagine the consequences if such a film fails at the box office. After coming this close, all we need is the public applauding the film and making it a huge success, because that will be an irreversible milestone in the history of modern commercial Hindi cinema. I wish that happens. I wish the Indian audience tells us filmmakers that they are a responsible lot and we will get the liberty to believe in our convictions and our genuine, sincere hard-work. I am saying all this because of many reasons, including the fact that I could not talk so highly about 'Udaan'. Being a part of that film, I felt it was 'nicer' to keep quiet. I really regret that in a way, because if I were not a part of 'Udaan', the film-buff in me, and the student of cinema in me, would have exalted the film beyond any sense of imagination. Today let me acknowledge this in public space for the first time - I think 'Udaan' was one of the most well-made Hindi films in recent memory. And the merits of its craft go beyond its Cannes nomination and its multiple Filmfare awards. I have been using that film as a text for my students, to talk about cinematic storytelling, shot division, sound design, and so on. But the biggest thing about 'Udaan' was something I could hardly talk about, because of lack of evidence, despite the strong intuition. After 'Lootera', I can talk about that one thing - that rare and precious achievement on motion picture that not many have the guts to aspire for, and most who do fail to fulfil. That one thing, which was evident in each frame of 'Udaan' and which comes back to us in 'Lootera' is called 'Authorship' - when the director of the film exerts complete control over the entire material, using cinema as a pen to write his novel on screen, when all cast and crew function proudly as puppets in the hands of the master craftsman, surrendering to his authority with complete humility, trust, and faith, when the captain of the ship becomes the ship itself and all its parts revel in that fact. Authorship in cinema is perhaps the most difficult achievement a film-maker can have. It takes entire life-times of intent and execution, clarity and madness, humility and self-belief to do that. Of course, going by that, it is too early to call, and unarguably so, Vikramaditya Motwane a true author. But after his second film, we can definitely see hope and can expect him to achieve what very few Hindi film-makers have achieved. So what exactly defines authorship in cinema? Well, it starts with the world-view of the film-maker. Does he have something to share with the world? It's not important how relevant or 'correct' his world-view is, having one, or several views in one, is good enough. It then goes on to the expression of his world view, using his medium. His aesthetic choices not only do justice to the world-view, making him a competent communicator of his opinions, but also show a unity of design, over several films, as we start seeing patterns emerge and talk to us - the way the director designs his shots, lights his sets, uses the motion or the stillness of camera, explores the possibilities of sound, extracts performances from his actors, paces his storytelling, and does all of this to create, despite the mad and clumsy process film-making is, one seamless whole, one organic body, one sum that is greater than its parts. Films are made anyway, an author creates works of art, that provoke, disturb or inspire people, from their minds and intellects, to their emotions and their feelings, and most importantly, their senses. In fact, it is the sensory perception that a master film-maker creates, purposefully and meticulously, that forms the most beautiful film experience, taking cinema beyond its story, trying to mimic music, or even dreams. Vikramaditya Motwane's Udaan made me believe that Hindi movies can still have substance and entertainment. 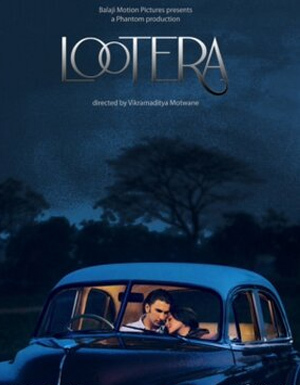 I'm sure Lootera will retore my faith in films all over again. i already had a good feeling about this film. now, your blog has corroborated it..... will catch it this week only. Good to know about this 'authorship', the lack of which has been driving our cinema elsewhere.. So intensely written! Your excitement is contagious. I wanna see the film even more badly now. Critics don't even recognize, let alone understand and appreciate, Monet-style abstract expressionism and leitmotifs drawing on several ancient spiritual and classical arts in Sanjay Leela Bhansali's cinema which is Motwane's biggest influence, I doubt if they'd ever understand Motwane's sensibilities and style, except for the obviously tangible portions. For me, SLB is the living cinematic legend of this 'millenium'. His cinema shows his deep knowledge of the rasa theory, a component of Bharatmuni's Natyashastra, owing to his training in Odissi dance form and understanding of Hindustani classical music, all of which have been revealed to us by sages in their deep meditative states of mind and not through any material intellectualisation. Unfortunately, much of the audience is only interested in tangible aspects which is the story and treatment. They don't immerse themselves in the purity of one's work. To understand SLB's cinema is to explore and come in touch with one's true primordial nature which manifest through platonic qualities of the soul like compassion, equanimity, wisdom, courage and fairness - all of which you find in his cinema. One really needs to sit down and watch his movies at least 3 times to understand the raised state of consciousness through which he conveys his cinema! I feel extremely privileged to be born in the era of Sanjay Leela Bhansali!!! And I hope Motwane continues to follow his footsteps. After reading your comment, the name which immediately comes to my mind is Terrence Malick. I think SLB is his alter ego. Self-indulgent but a living genius. So very second that, except that their exercise is in indulgence in the search of Greater truth - an indulgence in selflessness portrayed through the beauty and catharsis in the human condition of the characters, often metaphorised by inanimate objects and cinematic devices. In my opinion, Lootera is not a great film. It is a film of great importance. I hope people go and watch it. I don't mind if many of them hate it. It is important that it is watched and discussed. And thank him for Lootera.